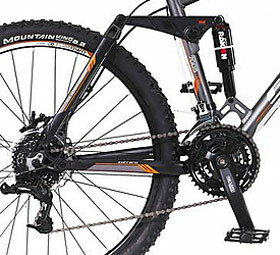 What benefits have buyers seen when riding this Carrera Banshee Full Suspension Mountain Bike? Starting with this idea of it being an entry level bike, there is some talk about this being a great beginner model that buyers have bought for their teenage children. Looking at some of the more basic benefits, there is praise for the smooth ride, the steering and handling and the use of 24 gears and Clarks hydraulic disc brakes. Others, meanwhile, would go further than this and say that it is a good bike for transitioning onto more challenging trails. There is the claim in the sales pitch that “taking on tough and harsh terrain has never been so much fun” and many would agree because it certainly seems to make the ride a lot easier. 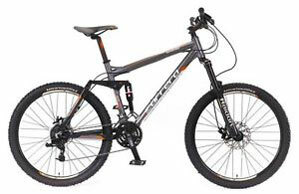 For the most part, buyers are attributing this enjoyable ride to the quality of the Suntour Raidon-R air shock suspension at rear of the Carrera Banshee Full Suspension Mountain Bike and the 26″ x 2.20″ Continental Mountain King tyres and some go as far as saying that it offers riders a lot of confidence when making jumps. The Carrera Banshee Mountain Bike clearly has a lot of fans but are there any flaws to limit is potential? Not every teenage boy and avid trail rider is 100% satisfied with the bikes design and performance and there are some small issues that have been raised in their reviews. Those that are looking at this as a possible reliable model for tougher rides on rougher terrains have questioned how well it would handle fast downhill pursuits compared to some of the more expensive models. Others look at simpler issues such as the quality of the Carrera saddle, which is quite slim and hard, and the weight, which is a little heavier than some would like at 15.4kg. Finally, there is the issue of durability because a few people have mentioned breaks and snaps on the frame. Summary: is this Carrera Banshee Mountain Bike the ideal transition bike or not? This issue of durability could be a problem. There is a lot to love about this bike for users of many different ages and abilities and the way that it works as beginner bike and a reliable model for more challenging terrains suggests that it should be a great aid for many years as riders learn and progress. Having said this, the idea of breakages and possible poor construction will lead buyers to wonder if it will take them that far. Either way, the Carrera bike is still an impressive mountain bike with its great handling, suspension and components and it still recommendable for the way that its performance is enjoyed by so many.